Wyoming RV Travel and Camping Adventures in the Tetons! We first visited Wyoming with our brand new travel trailer during our first year of full-time RV travel in the summer of 2007, and we found that Yellowstone National Park was just as awesome as everyone said. There were fabulous and bizarre steaming pools and geysers as well as elk and buffalo sharing the roads. But it was nearby Grand Teton National Park that really took our breath away. Our minds still reeling after those incredible mountain views, we visited unique Devil’s Tower. As we continued our travels, the Tetons remained on our bucket list, but we didn’t get back there for seven years! In the summer of 2012, we passed through Wyoming again, discovering a modern-day boomtown in Pinedale, where the natural gas industry was flying high. We also explored the western side (Wyoming side) of magical Flaming Gorge National Park. During the summer of 2014, we finally returned to Grand Teton National Park in our fifth wheel trailer. 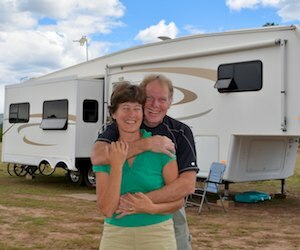 It was our first year of living a life of full-time RVing adventures after the end of our sailing cruise of Mexico, and were blown away once again. Then we were back in Wyoming again during the summers of 2017 and 2018 when we discovered the fabulous Big Horn Mountains and drove the Beartooth and Chief Joseph Highways which totally knocked our socks off! Chief Joseph Scenic Byway – Mountain Majesty Near Yellowstone NP July 20, 2018Chief Joseph Scenic Byway is a glorious drive near Yellowstone that can be combined with the Beartooth Highway for a great day trip. Wyoming Back Roads by RV – Rugged, Remote and Wild! May 18, 2018On an eastbound back roads RV trip across the central Wyoming we discovered remote and rugged camping and wild, stormy vistas. Devil’s Tower, WY – Remember “Close Encounters of the Third Kind” ?? September 30, 2007Devil’s Tower Wyoming, known for the movie “Close Encounters,” is sacred to the Lakota and has a cool community of prairie dogs. Grand Teton National Park, Wyoming – Stunning! September 28, 2007We visited Grand Teton National Park in Wyoming and were awe-struck by the majesty of the mountains reflecting in Jenny Lake. Yellowstone National Park, WY – Bubbling Geysers September 22, 2007Yellowstone National Park has bubbling geysers and hot springs and lots of mysterious looking mineral formations. Yellowstone National Park, WY – Big Game Animals September 17, 2007Yellowstone National Park lived up to its billing with big game animals up close and elk courting outside our RV window.